Best grown in deep, loamy, humus-rich, medium moisture, well-drained soils in full sun. Performs well in gravelly loams. Tolerates a wide range of soil conditions, including average garden soils, but must have good drainage. Best sited in a location sheltered from winter winds (preferably a sunny south-facing slope) and well removed from frost pockets. Needs good air circulation. Young growth may be damaged in spring by late frosts. This grape is self-pollinating. For quality fruit production, it needs a support system, training, regular spraying and regular pruning to maximize fruit production. The straight species is not commercially grown for fruit production because of the existence of hundreds of superior-fruiting cultivated varieties many of which are widely grown in wine-producing areas throughout the world. In the U.S., cultivars are primarily grown in California. Plants generally do not perform well in the Eastern and Midwestern parts of the U. S., however, due in large part to climate (winters too cold in northern areas and summers too hot and humid in southern areas). For more detailed information on grape culture for the State of Missouri, see University of Missouri Extension publications on Home Fruit Production, Grape Culture (G6085) and Home Fruit Production Grape Training Systems (G6090), both of which are available for inspection at the Kemper Center Information Desk or on-line at Missouri Extension. Vitis vinifera, commonly known as European wine grape or common grape, is a woody, deciduous vine that climbs by branched tendrils to 40-60’ long over time if left unpruned. Plants grown for grape production are typically pruned much smaller (3-9’ long). This species is probably native to southwestern Asia (Caspian and Caucasus regions) and adjacent Europe. It spread over time throughout much of Europe. It was transported around the world by European explorers from the Age of Discovery onward. This vine can climb to the tops of trees or sprawl horizontally over low-growing shrubs. Flaking bark shreds in strips on older stems. Ovate to suborbicular leaves (to 5-9” across) have long stalks, 3-7 palmate lobes, coarsely toothed margins, bristly undersides and cordate bases. Small, greenish, hermaphroditic flowers bloom in May-June in dense panicles. Flowers give way to bunches of soft pulpy grapes (botanically berries) which ripen in summer. Grapes are somewhat variable in size, form and color. Grapes of this species are grown for a variety of purposes, primarily for making wine, but also as fresh fruit from the vine or dried as currants, raisins or sultanas. Vines are infrequently grown for ornamental purposes only. Leading white wine varieties of this species include: Chardonnay, Gewurztraminer, Muscat Ottonel, Noblessa, Pinot Blanc, Pinot Gris, Sauvignon Blanc, Semillon and White Riesling. Leading red wine varieties of this species include: Cabernet Franc, Cabernet Sauvignon, Merlot, Limberger, Pinot Meunier, Pinot Noir and Trollinger. The main difference between red wine and white wine is that the red grape skins are included during fermentation of red wine thus giving it the dark red color. Genus name is the Latin name for the old world vineyard grape (Vitis vinifera). Grapes grown for fruit production are high maintenance plants that require regular pruning and ongoing attention to insect and disease pests. Grapes are susceptible to a large number of diseases, particularly in humid summer climates such as Missouri, including anthracnose, black rot, downy and powdery mildew, phomopsis, gray mold, crown gall, Pierce’s disease, various virus diseases and botrytis bunch rot. Insect pests include phylloxera, grape berry moth, Japanese beetle, leaf hopper, leaf roller, mealy bugs and flea beetles. Information on dealing with disease problems may be obtained from most state university extension programs. 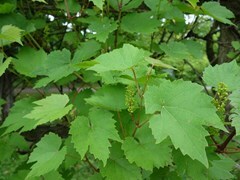 Common grapes are primarily grown for fruit production in home fruit gardens where ornamental value is not a concern. However, grapes do in fact have some good ornamental value: (a) bold summer foliage, (b) some fall color, (c) showy edible fruit and (d) twisted trunking/branching which is often best seen in winter. When grown on fences, walls, trellises, arbors or other structures, grapes can be quite attractive year-round and can provide good cover, screening, or shade to areas around the home.